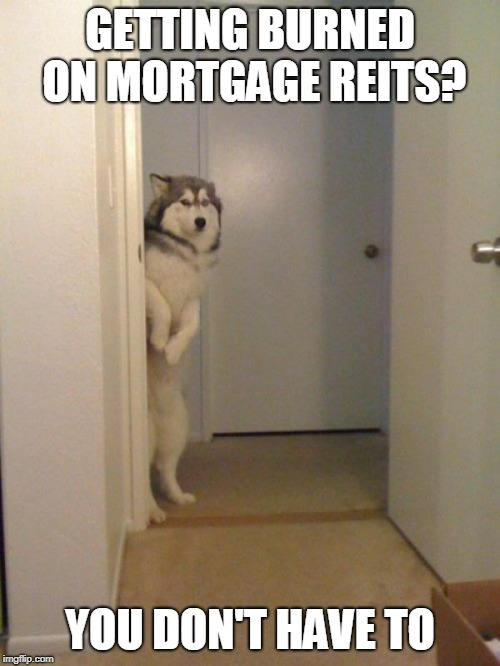 You don't have to get burned investing in mortgage REITs. 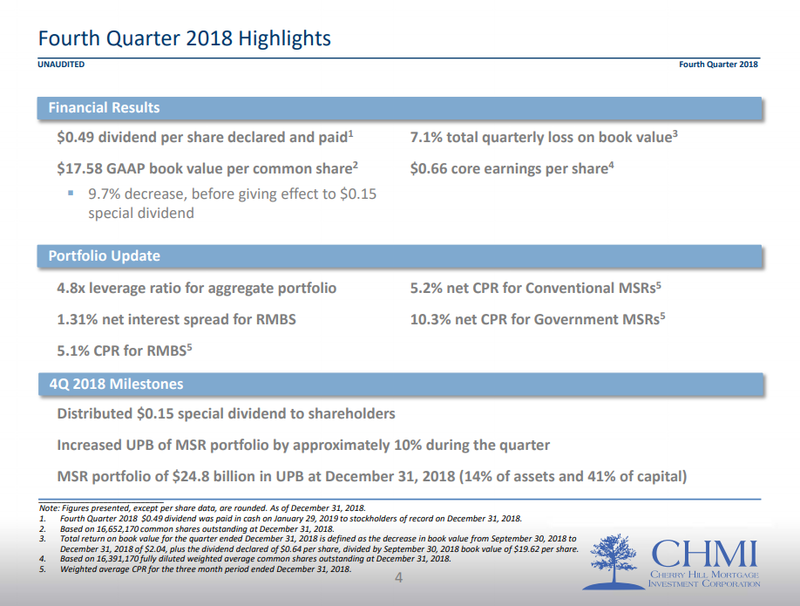 CHMI has been one of the bottom performers in the mortgage REIT sector. Following the dramatic underperformance of CHMI, we are comfortable removing the bearish rating. 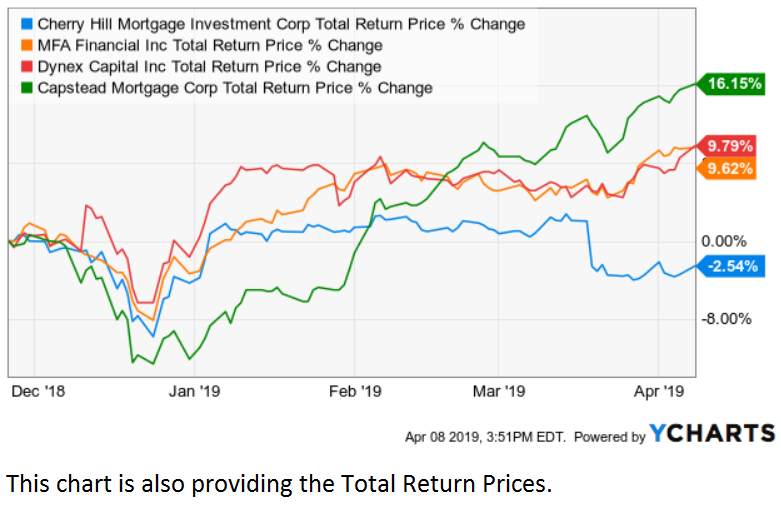 The mortgage REIT market frequently has periods that should make investors question efficient markets. There are periods where things appear efficient, but there are also some incredible failures and the duration of those failures can be as short as a couple of hours or as long as a few quarters, perhaps even a few years. In our experience, something between the extremes is far more common. Remember that prices are still determined by supply and demand, so it is entirely possible for share prices to deviate from comparable value in other similar companies. To be more precise, it is not only possible, but it is also common and uncovering those discrepancies is a major part of our work. Cherry Hill Mortgage Investment Corporation (CHMI) is another mortgage REIT we frequently blasted. We didn’t like the management’s prior decisions to issue shares materially below book value. 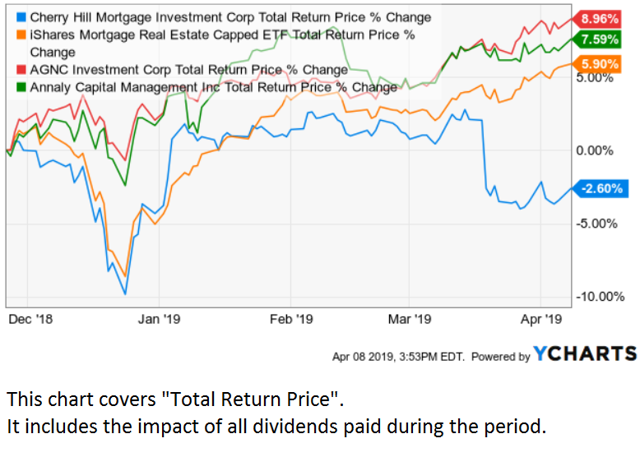 We think CHMI deserves to trade at a discount to several of their mortgage REIT peers. While their discount isn’t large today, it comes during a period where spreads between RMBS and Treasuries remain fairly wide. A 7.1% quarterly loss on book value was pretty rough, but it wasn’t outside the range established by peers. We see the first quarter of 2019 as a much better environment for CHMI. Their book value could be up or down slightly, but we don’t expect a substantial move. Because CHMI’s portfolio includes a large position in MSRs, we expect a larger margin for error on estimates. One major difference between CHMI and several of their peers is that CHMI won’t benefit directly from lower rates. 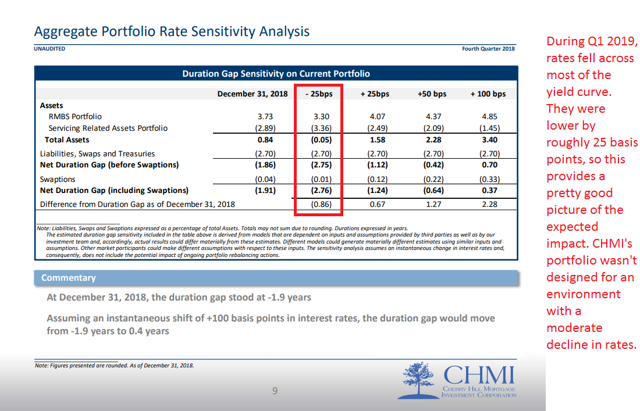 While many peers had at least a small amount of positive duration in their portfolios (gaining book value if rates declined), CHMI’s portfolio carried negative duration. That helped it a great deal when interest rates were rising, but it is a challenge when rates decline. We see a rather mediocre first quarter in the cards, but it shouldn’t be a disaster. For us to enter a position, we would want to see a much lower price-to-book-value. The current discount isn’t good, but it is enough that we are swapping CHMI to a neutral outlook. Since 11/26/2018, shares have declined modestly while paying out dividends to offset most of the losses. That makes it sound like the bearish rating wasn’t very good. 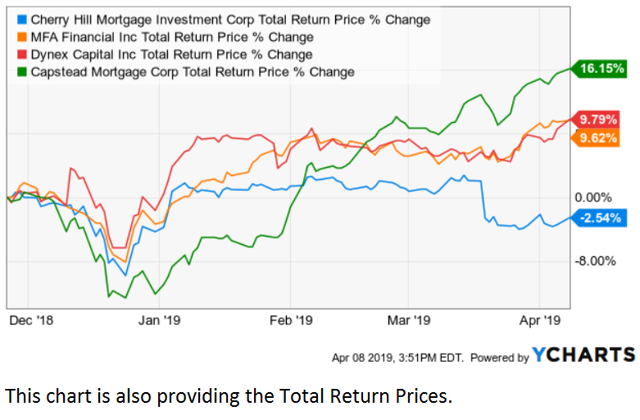 Quite to the contrary, the bearish rating was excellent when we compared the performance of other mortgage REITs. When comparing the results on Total Return Price, it is clear that we were right to have a bearish outlook. 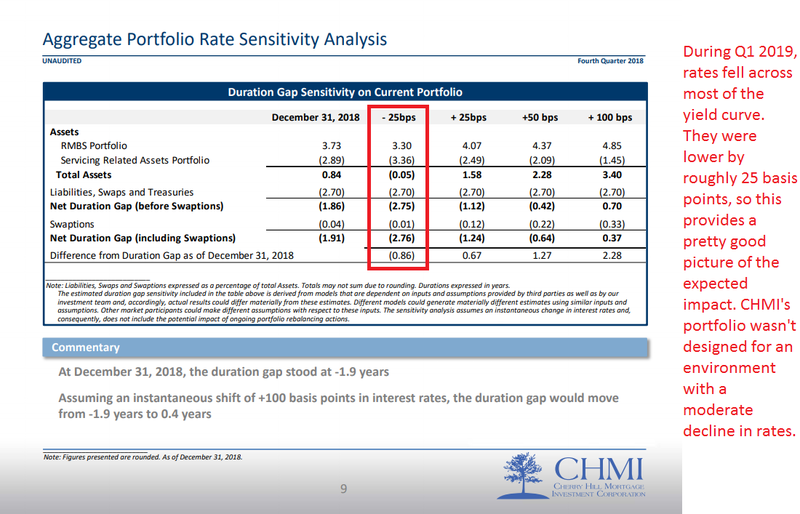 On average, the other investments beat CHMI by nearly 10% over that period. Some investors will argue that losing 2.6% doesn't qualify as "horror." Since we focus on relative values, we are looking at the disparity in the results. Being down 2.6% wouldn't be bad if the sector was also down about 2.6%. On the other hand, being down 2.6% after the sector rallied is quite painful. On average, our picks beat CHMI by over 14% during that same time period. This wasn’t a case of CHMI suffering along with the rest of the sector, it was CHMI declining while the sector rallied. Following the dramatic underperformance of CHMI, we are comfortable removing the bearish rating. We also recently removed our bullish rating from CMO. Not all investments are created equal. At The REIT Forum, we recognize that. That’s why we offer REIT ideas and strategies for every type of investor, from novice to ultra-experienced money manager, and everyone in between. Want a simple, low-risk strategy that still delivers sector-beating performance? Check out our Safe Income Portfolio. We also offer preferred shares coverage, along with a deeper dive into the common shares of the individual stocks we hold and cover. What’s more, we eat our own cooking, and we give you a bird’s-eye view into our own portfolio. Disclosure: I am/we are long DX, DX-B, CMO-E, MFA-B. I wrote this article myself, and it expresses my own opinions. I am not receiving compensation for it (other than from Seeking Alpha). I have no business relationship with any company whose stock is mentioned in this article.